Customer satisfaction is more than a saying; it's a PROMISE! The 2019 Subaru Forester has been fully redesigned inside and out. Confidence is built right in, thanks to standard EyeSight® Driver Assist Technology and Symmetrical All-Wheel Drive. It features extensive upgrades to its interior materials, passenger space, and on-board technology — including the all-new DriverFocus™ Distraction Mitigation system, available for the first time ever and only on the 2019 Forester. EyeSight has been found to reduce rear-end crashes with injuries by up to 85%. EyeSight monitors traffic movement, optimizes cruise control, and warns you when you're swaying outside your lane. The Automatic Pre-Collision Braking feature can even apply full braking force and bring you to a complete stop in emergency situations. And with Lane Keep Assist, it can even help you steer back into your lane. Another way Subaru designs vehicles with your safety in mind. The 2019 Forester features an all-new state-of-the-art system that helps reduce distracted driving for both new and experienced drivers. Each day in the United States, more than 1,000 people are injured in crashes reported to have involved a distracted driver. Working with our award-winning EyeSight Driver Assist Technology, the new DriverFocus system is like having an attentive co-pilot along for the ride, available to give a helpful alert if a driver becomes distracted or drowsy. For added convenience, DriverFocus can also recognize up to five different drivers and remember their preferences, including seat position, climate settings, and outside mirror position. The latest STARLINK Safety and Security system features include Advanced Automatic Collision Notification to alert first responders when an airbag deploys, and SOS Emergency Assistance to lend a hand when you encounter trouble on the road. All-new Remote Engine Start with Climate Control, accessible via your smartphone, ensures your Forester is ready and comfortable. There’s also the new STARLINK Concierge service for personal assistance with tasks like navigation, restaurant reservations, and scheduling service appointments. A suite of safety technologies is available on the 2019 Forester to help protect you and your passengers. The Blind-Spot Detection system warns you with a visual indicator in each side mirror if it senses a vehicle in your blind spots. Rear Cross-Traffic Alert helps warn you of traffic approaching from the side as you are backing up, and a standard Rear-Vision Camera enhances visibility when reversing. And with available Reverse Automatic Braking, your vehicle can even stop itself to help avoid objects behind you. The Forester can light up dark corners with available LED Steering Responsive Headlights, which actively track in the direction of a turn to enhance visibility. Available High Beam Assist works in conjunction with EyeSight to automatically switch the headlights between the high and low settings when an oncoming vehicle is detected, enhancing safety for both you and other drivers on the road. The balanced design of Symmetrical All-Wheel Drive creates uniform stability and delivers an optimal distribution of power for maximum traction in virtually any weather or road condition. It delivers better handling, improved efficiency, and a quicker response to road conditions. 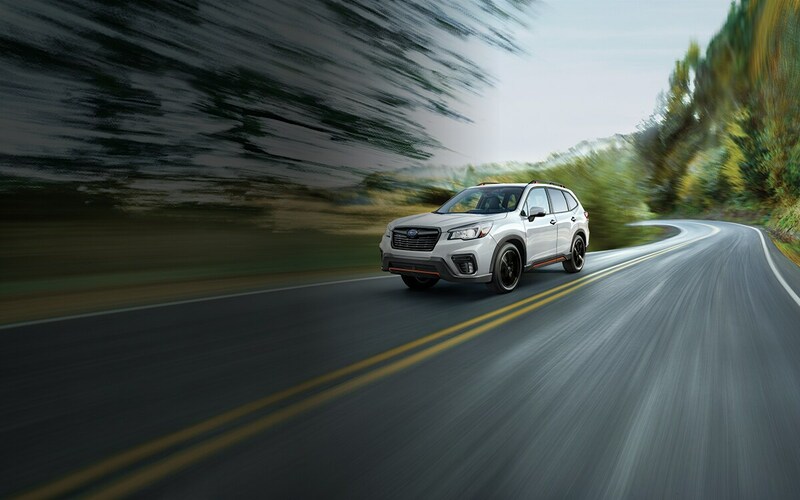 The durable SUBARU BOXER® engine combined with the standard Lineartronic® CVT allows the Forester to get up to a fuel-efficient 33 MPG highway. Now you can haul more gear for more adventures, thanks to up to 76.1 cubic feet of cargo space, and with an extra-wide rear gate opening, loading and unloading large items is easier than ever. A Power Rear Gate is available to allow opening and closing even when your hands are occupied, and now opens, closes, and locks the entire vehicle with the touch of a button. And to bring your longer items, simply adjust the 60/40 split-folding rear seats and watch the Forester adapt. With available Wi-Fi connectivity built right into the 2019 Forester, passengers can stream and share their favorite content online using the 4G LTE Wi-Fi hotspot. From the moment you start your Subaru, up to eight devices can connect. Then everyone can easily stream their TV shows, movies, and music, or play games, check email, and much more. The STARLINK Entertainment Anywhere package is available to make every trip in your Forester even more enjoyable. With iPad®, you and your passengers have endless opportunities to stay connected, engaged, and entertained. Passengers can also utilize the built-in Wi-Fi capability to stream their favorite content or search the web. This premium entertainment experience is a great value and can be enjoyed in the backseat of your Forester or wherever else your travels take you. An updated STARLINK Multimedia system with Apple CarPlay™, Android™ Auto, and Pandora® integration comes standard on the 2019 Forester. Wireless pairing and hands-free smartphone operation allow for safe and easy connection to your favorite apps and content. Access news, navigation, music, podcasts, and more through available STARLINK apps, such as iHeartRadio®, Yelp and Magellan, and SiriusXM®All Access Radio. Plus, a built-in and voice-activated navigation system powered by TomTom is available, as well as an 8-inch touchscreen. With 8.7 inches of ground clearance and standard X-MODE with Hill Descent Control, almost any destination is within reach. X-MODE optimizes the Symmetrical All-Wheel Drive system for maximum traction on slippery surfaces. A new dual-function X-MODE with settings for snow, dirt, and mud is also available. Raised roof rails are available on the 2019 Forester to provide the flexibility to handle any adventure —whether you’re bringing kayaks, bikes, skis, or cargo carriers. Integrated tie-down points are also available for even more loading options. The all-new Forester Sport showcases bold design elements on its sleek exterior and sophisticated cabin upgrades inside. It rides on uniquely finished 18-inch wheels, features LED fog lights, and comes with roof rack tie-down points for added versatility and functional style. And with Sport-specific tuning for SI-DRIVE and the new dual-function X-MODE®, the Forester Sport is ready for anything. The Forester Sport interior is clad in high-quality textured materials with unique orange accent trim and two-tone gray upholstery with orange contrast stitching to create a cabin that feels as sophisticated as it looks. Standard 18-inch alloy wheels, with an aggressive design and exclusive black finish, give the Forester Sport a foundation of athletic style. The Forester Sport features integrated roof rail tie-down points that not only provide cargo-carrying capability, but also a finishing touch to its bold design. SI-DRIVE — or Subaru Intelligent Drive, is a powertrain performance management system. Sport models feature an exclusive Sport Sharp (S#) SI-DRIVE mode for enhanced throttle response and an even more engaging drive. The Forester will be with you on all the journeys ahead — 97% of Forester vehicles sold in the last 10 years are still on the road today. That long-lasting quality is one reason why Forester retains its value better than any other vehicle in its class for 2018, according to ALG. The all-new Forester offers even more room for comfort, with up to 111.9 cubic feet of passenger volume. With added rear legroom and an available panoramic moonroof, the Forester provides an open, airy experience for all. The cabin has also been upgraded with high-quality, soft-touch materials and contrast stitching throughout, along with standard automatic climate control. And now the second row even offers available heated seats, A/C vents, and USB ports to bring front-seat comfort to every passenger. The all-new Forester is powered by a more powerful direct-injection SUBARU BOXER® engine, now featuring Auto Start-Stop functionality. With 182 horsepower and up to 33 MPG, it provides even more efficiency and capability for your daily adventures. The 2019 Forester is built on the Subaru Global Platform, using extensive high-strength steel for long-lasting quality. With great durability, rigidity, and vibration resistance, the Global Platform provides enhanced crash safety, a quieter interior, better driving feel, and confidence for years to come. Giving the interior an even more expansive atmosphere, a power tilt/sliding panoramic moonroof lets you feel the breeze, brighten the day, and check out the stars.